Look here possible solutions, when your Canon printer does not print correctly. Follow paos and if you have questions, write a comment. This publication does not give a direct solution to the problem because the Canon printer does not turn on, what we do is raise a number of procedures that can help you easily identify the cause of why the printer is not turned on. First of all you need to know that we must take care when dealing with electricity, be careful in testing below and at all costs avoid direct contact with electricity. The first thing to do is to test whether the electrical connector where we are trying to contact the printer is working perfectly, do a little test by plugging another appliance of the same electrical connector. When we tested that everything is working properly and that the problem actually lies in the printer we will have our printer further eliminate possibilities, such as the power cord electricity, normally Canon printers have a power cord electricity supplied information to the printer, it is possible that this damaged, usually occurs rarely but may pass, as we seek to verify the operation of this, if this be damaged must be replaced. 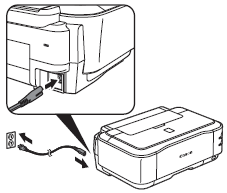 We can not forget check out the source of the printer, this is located at the bottom of the printer, right where it enters the power cord electricity, is within this fountain where the entire process of power conversion to be Fit work with your printer. If you are able to get a source of the same in any other printer that has been damaged may try to replace it. Even replacing the power supply to the printer and this ongoing problem, it is possible that the problem lies on the main board of the printer, for it requires a little more information in the area of repair of printers, otherwise account with this knowledge it is recommended to take your computer to where a technician in the area. You can choose to see if the printer has a guarantee, if so use it, please ates slope that can not make a printer warranty if you have a system installed ink or refilled ink cartridges. Do your best to repair remember that it is not good vote an old printer printer.